§ 32 Responses to Functional Art, Inspired by Nature: Many Thanks to Talented Ana White and Knock-Off Wood…"
Thank you Ana. You truly are my hero. Now we need an electrician in the community to help Condo Blues, (above), with her Nelson Bubble Lamp dilemma! I’m so glad I found your site (via Ana’s happy referral), because I also love to garden! Can’t wait to read more of your site! Wow! Love your island! Fabulous colour and the grain is just gorgeous. It looks as smooth as a baby’s bum – can’t wait to see it with the oil on… Could you post more pics once it’s finished, please? Thanks also for the link to Ana’s Knock Off Wood. So many possibilities – where to start? And a DIY Furniture show on TV? What a great idea! There is no substitute for actually watching someone while learning: a carpentry apprenticeship on air… You gotta love it! Oh and you were speaking of building plans for the garden, how about some for bat houses? They’re #2 on my list(s) of important garden creatures, right up there with pollinating insects (my fuzzy honey bees being #1). Thanks Julie. I used it to spread out everything and make my pancakes yesterday! And Deb – yes – I think Ana White is amazing. And yes again… garden projects on the way. Bats are wonderful. I like to name the ones I see flying from my roof in spring. It is finding websites such as yours and Ana’s that keep me from driving the car right off the bridge in these last days of winter. Thanks for the inspiration. Welcome! Nice to hear from you. I’m sure glad you went to Ana’s site. She is a genius and quite a fabulous personality. And thank you for the compliment on the island. I actually had quite a good time prepping breakfast there this morning. It’s amazing what a difference it makes. Ana has lots of wonderful smaller-spot plans. Glad to provide you with a bridge abutment. Stay between the yellow and white lines and I hope to see you soon. Just linked over from Knock Off Wood and had to tell you that this island is AMAZING!!! Just what I’ve been hoping for – definitely going to try to put this into action:)Thanks so very much for the incredible inspiration! ;) Hi Lillian. Thanks for stopping by and commenting. I’m so happy that Ana has created and posted plans for this project, (heaven knows I never could have done the math! ), so that others can create this great island. 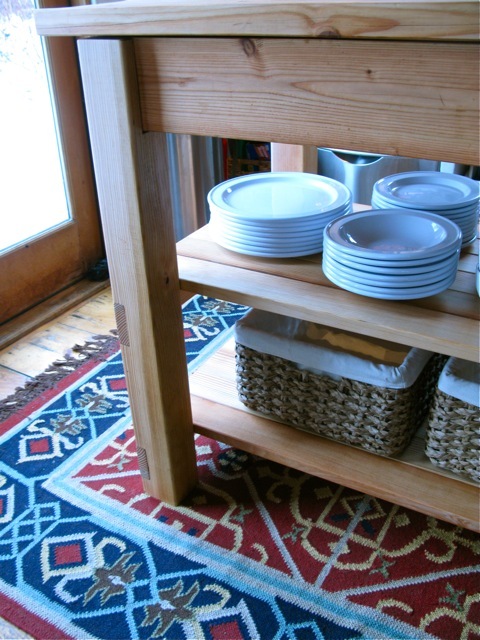 I think it would also make a great shop table or potting bench – very affordable if made from inexpensive pine or reclaimed/salvaged wood. 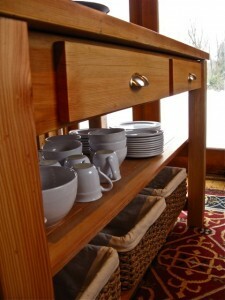 Knock-Off Wood is one of the best resources I have found anywhere, and Ana is one inspirational and generous woman. We are lucky indeed to have found her! Michaela, that is a gorgeous creation! I have to ask you though – what did you use to hide the nail holes? I can’t seem to find any on that island! Whenever I try to use wood fillers, the discoloration between the fillers and the wood makes it even more noticeable after staining than if I’d just left it alone. Hi Billie. Thank you. Ah – ha. Good eye to notice that detail. Yes, we countersunk the fasteners with a countersink drill-bit, (see Ana’s plan), and then we created plugs with a shank plug cutter, (a great tool for finishing wood stairs, floors, furniture, etc). 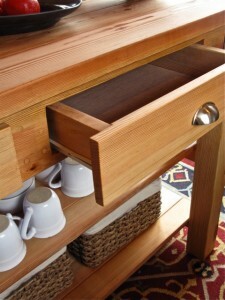 The plugs were made from a scrap piece of the douglas fir and then glued into the countersunk holes. If you like that clean look, it’s a great tool. But if you can’t afford to go that route, then you could always use hand forged nails. I have an old trunk with old-style nails, and I love it. My next project will be receiving a beautiful milky smooth finish thanks to you! 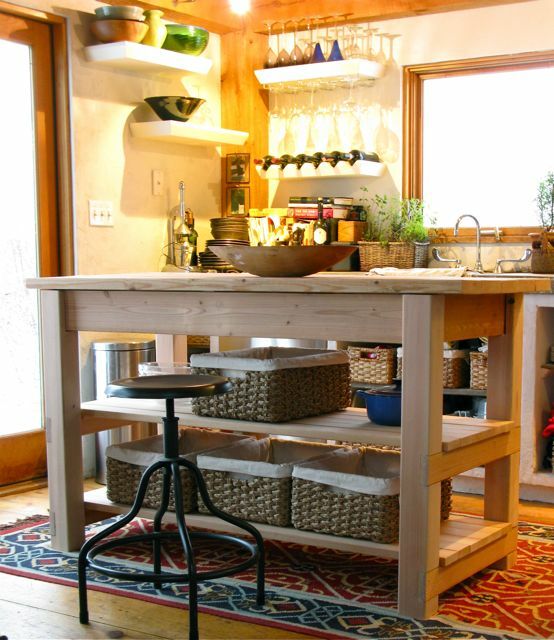 I know the island is the star of this photo, but I love the shelves you’re using to store your wine and wine glasses! Did you make those too or where did you get them? Thank you for sharing the shank plug idea with me! I’m going to get these to try to hide some nail holes for my next project. I think they’ll save me a lot of money and frustration in the long run over using wood fillers! I can’t believe I’d never heard of them before! Thank you again, Michaela! The wine rack/shelves/glass storage in my kitchen are units from the P.B. catalogue a few years back. Those would be super easy to make out of pine with a simple satin paint finish. The metal wine glass hardware, (hanging), can be purchased online, and I am pretty sure that you can also find them at some better hardware stores. The back of the shelf has two parts… one piece is a mounting strip that is screwed to the wall, and the other piece is a matching strip on the shelf, which slides into the mounted strip on the wall. I know I have seen that hardware online too, (floating shelf bracket hardware). It would be fun to make more. I sure wouldn’t bother buying them again. They are definitely a beginner project. :) Nice to hear from you Patty. I linked from Ana’s brag board. Not only is the island constructed beautifully, I came to your website looking for info on how you got such a beautiful finish on it so thanks for posting it on a comment above. A lot of the diy brag board projects on Ana’s site don’t look quite polished because I guess it takes a little more know-how than I posess to finish/paint them with a “wow.” Well done on your island’s finish – it really looks expensive too. Love it! I also love the stool! Where did you get it? Wow, it’s absolutely lovely. I’m green with envy. If we only had the space our tiny little condo! Your writing is so fun to read. . . I loved this post! Hi Allisha, sorry for the delayed response… I am back to gardening work now that the snow has melted! That stool was made by the dreaded PB. I got it at a tag sale, and wanted another but they were discontinued. I won’t buy anything from them anymore after the bully-incident w/Knock-Off Wood. But – I have seen some similar stools at the Sundance Catalog Website. Warning: they are not cheap. I must learn how to WELD :) You might try trolling Ebay or Craigslist for used stools? (just a thought). I am looking for 2 more now myself. Thank you Courtney. You know, you could make a smaller one… or a rolling cart based on the design. But you will have to be good with the math, (um, not my forte!). Looking at the Island, I enlarged it and could see kitchen cabinets behind it. Do you have plans for the kitchen cabinets? I agree with Michelle and would like to see pics of the top and consider a different top. I just discovered you site and love it. Thanks!!! Hi JoAnn, Thanks so much for the kind words. I’m so glad to hear that you enjoy the site. 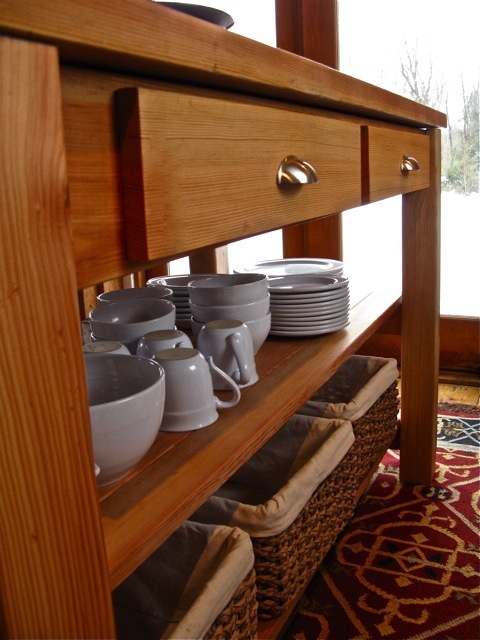 Although I built this kitchen countertop, I used plans from Knock-Off-Wood, and I am going to refer you to that site for details and top options. I don’t have a close up shot of the top posted anywhere on the site at the moment… though Ana White has details on how to build it. By cabinets, I imagine you mean the shelves on the wall? Those were not built by me, but were purchased from Pottery Barn. Ana may have plans for similar shelves on her site. I would check there first. The lower shelves are custom, built-in units we built consisting of lath and plastered 2 x 4’s. 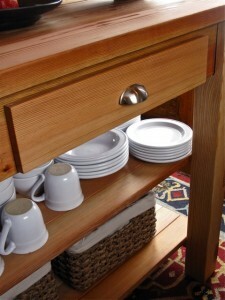 They actually are no cabinets in my kitchen… it’s all open shelving. Ana’s site is amazing, and you will find super-detailed plans there. Good luck! Thank you so much for stopping by! Hi! Ok.. thanks for posting.. my husband just followed Ana’s plans and built this today.. we went to home depot and bought wood. Can you tell me in simple-step by step – how to make mine look like the top picture on here? Can i buy what I need at home depot? We are beginners! I don’t know if you still read responses on this or not but I would love to see more pictures of your kitchen. I am having someone local custom-make your island for my kitchen and will eventually need to have a piece built for my sink and would love to see more pictures for inspiration! You are currently reading Functional Art, Inspired by Nature: Many Thanks to Talented Ana White and Knock-Off Wood… at The Gardener's Eden.